The LVCN120 series has been discontinued. Please contact our Flow Engineering department. The LVCN-120 three sensor controller provides an automatic fill or empty capability with an additional high or low alarm. This controller has two 10 amp SPDT relays along with selectable normally open or normally closed states. LED enunciator lights provide the user with sensor, power and relay output status. Relay chatter can also be eliminated with a 0 to 60 second time delay adjustment. The LVCN-120 has a selectable latch on or latch off relay configuration. 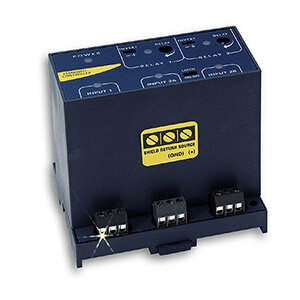 The controller is conveniently installed on an EN 50 022 standard DIN rail or panel mount. For CE approval, add suffix "-CE" to the model number, add $50 to the price.